he comes out on that stage with wearing a pair of Blue jeans and black t-shirt, and presents the apple products in such a mesmerize way that everyone wants the product in hand at that point of time.it just dazzles the press. yes I'm talking about the marvelous marketing guy sir Steve job's,it seemed that no one creates "hotness" like sir Steve job's. i guess all of you people once see the introduction of iPhone.word of mouth was the killer strategy that they have been applied for many years and what they received was valued at $400 million. As per the famous piper jaffray's annual team survey, more than 84 percent had heard of the iPhone and 25 percent said they would pay $ 500 for it.it is better to mention here that the only advertising repeated "hello" for more than 30 times in the film and television media. It was aired only during the time of Oscars only. I think now you have under-stood...how exactly they utilized our marketing term i.e. "word of mouth”. it may not be a wild success but it sure did get a lot of press that made it seem very hot. OK..........did you know that recently Steve Jobs has to go on medical leave at precisely this point of time.Lacking information about Mr. Job's latest illness, questions have focused on what his absence will mean for Apple. 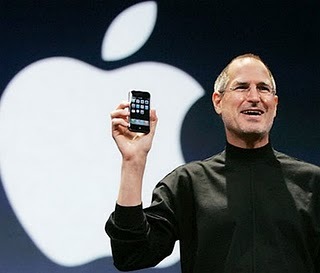 following are some of the questions regarding the future of apple and its soul guru Steve jobs. do you think that the management team that will run things while he's on medical leave? What will be the impact be on a stock price that's made Apple one of the most valuable companies in the world? is there enough new things in the pipeline of the company to sustain its financial performance? of course these questions make worry mark on the faces of thousands of people. In an age when we routinely carry miniature supercomputers in the form of smartphones in our pockets, it's hard to fully grasp the impact of Mr. Job's first great product, the Apple II personal computer. The technological wizardry behind it - Those high-res graphics! That disk controller! - largely belonged to co-founder Steve Wozniak. But the vision of placing technology in normal people's hands, and the passion to build a company devoted to that concept, came from sir Steve Jobs. at this point of time of comparison with Mr. Jobs may not be Bill Gates and Jack Welch nor other global industrialist's. When in one interview, was asked whether sir Steve Job's legendary control-freak perfectionism didn't sometimes drive him a bit crazy. His answer captured Mr. Jobs perfectly: "It's OK to be driven a little crazy by someone who is so consistently Right." OK finally, it's a great lesson of demonstration and introduction strategies for the the future manager's,we can learn the way to deal with in the complex world.